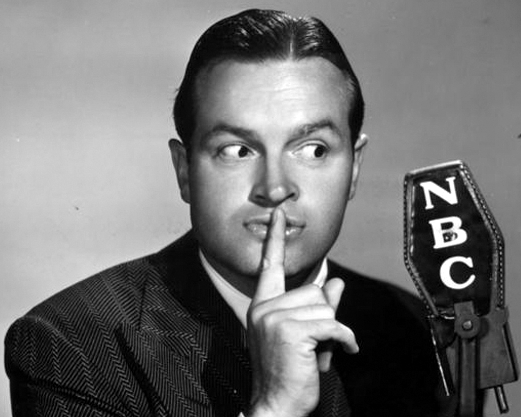 IT WAS NO SECRET - BOB HOPE LED NBC AT NUMBER ONE FOR FOUR STRAIGHT SEASONS. Jordan Scores Again! The biggest news story since Pearl Harbor broke in mid-August, 1945, and NBC had it first. Neutral Switzerland brokered the surrender negotiations between the Allies and Japan, so all communications between the combatants went thru Geneva. Once again - as he was in Munich at the war’s start -.NBC’s Max Jordan was also on the spot at its finish. Ironically, the outstanding war reporter became a man of peace. Jordan retired from NBC in 1947 at the age of 52. A PhD in religious philosophy, he become a Benedictine priest - a position in which he served for the remaining 31 years of his life..
Broadcasting’s Big Business Boom. The networks were sold-out as the nation transitioned to peacetime. A record 232 sponsored programs were rated in the season’s prime time Hooperatings - the all-time high between 6:00 and 11:00 p.m. ET. In the five years since the beginning of World War II, total annual radio revenues had doubled and the networks were approaching the $200 Million mark in sales. The tax breaks given to advertisers and paper rationing that limited print competition created a bonanza for broadcasters. The FCC wagged its finger at the industry in March, 1946, when it issued a 140 page report that complained of over-commercialization. It was strictly for show purposes. The Magnificent Seven. Industry trade journal Broadcasting reported that the four networks received 60% of their 1945 revenue from manufacturers of foods, beverages, soaps, patent medicines and toiletries. Seven of these major corporations sponsored half the 1945-46 season’s Top 50 programs. Procter & Gamble ranked first by spending $14.9 Million for a mix of programming. The Cincinnati soap giant had four prime time shows that made the season’s Top 50: Truth Or Consequences, The Life of Riley, The Rudy Vallee Show and The FBI In Peace & War. In daytime radio, P&G sponsored half of ABC’s popular Breakfast In Hollywood and block- programmed CBS for an hour every afternoon at 1:00 with Life Can Be Beautiful, Ma Perkins, Young Doctor Malone and The Road of Life. It followed with a second hour-long buy on NBC at 3:00 with Woman of America, a repeat broadcast of Ma Perkins , Pepper Young’s Family and The Right to Happiness. Sterling Drug spent $8.25 Million for programs supplied mostly by producers Frank & Anne Hummert - soap operas Stella Dallas, Lorenzo Jones, Backstage Wife and Young Widder Brown, plus Hummert’s prime time music shows Manhattan Merry Go Round, The American Album of Familiar Music and Waltz Time, which all made the season’s Top 50. Sterling also sponsored the long running Top 50 hit Big Town, which wasn’t a Hummert production. General Foods spent a fraction over $8.0 Million for soaps When A Girl Marries, Portia Faces Life and The Second Mrs. Burton plus four Top 50 programs: Burns & Allen, The Aldrich Family, Fanny Brice as Baby Snooks and The Dinah Shore Show. The conglomerate also extended its nearly decade long sponsorship of Kate Smith’s prime time show plus her daily 15 minute noontime talk show on CBS that delivered a strong 6.3 rating. For a chunk of its $7.2 Million, Lever Brothers got two of the season’s Top Five prime time programs, Monday’s Lux Radio Theater and Bob Hope's Pepsodent Show on Tuesday The company also had Top 50 winners in Amos & Andy and The Bob Burns Show. Unlike Procter & Gamble’s strong daytime presence, Lever sponsored only two soaps, Big Sister and Aunt Jenny’s True Life Stories. Mutual remained the largest network in terms of affiliates by offering a strong news lineup, a menu of variety programming and few strings attached. The network grew by 139 new outlets in 1945 for a total of 384 affiliates, followed by ABC’s 195 stations, NBC’s 150 and CBS’s 145. TV Tests Tubes & Tolls. CBS and General Electric successfully broadcast their 525-line color television system in October and demonstrated it to the press in February. The technique, developed by 39 year old Peter Goldmark was hailed for its quality. But Goldmark’s technology had a major drawback - it was incompatible with the black and white television system already in use. Manufacturers employing the existing system, led by RCA, Admiral, Philco and Zenith, promised consumers that new postwar black and white television sets would be in the stores and in good supply by mid-1946. By flooding the market, they planned to make any conversion to the CBS system unacceptable to the public. Earlier in the season NBC had transmitted the Army-Navy football game over a 90 mile coaxial cable from Philadelphia to New York. In February, the cable extended another 135 miles to Washington where Lincoln Day ceremonies were relayed back to New York. As it was in early network radio, AT&T’s wires were again the choice to link networks and stations for the grainy television images. NBC’s first television station, WNBT/New York City, issued its first rate card for programming that was still limited to a few hours every evening. Eight dollars bought a minute of commercial time. Television still had a long way to go to pay for its expensive development. Until then it was up to radio to support the new medium. Allen’s Ratings Health Restored. After four seasons on CBS, Fred Allen returned from a year’s sabbatical to a prime spot on the NBC schedule. (3) Standard Brands signed Allen for its half hour immediately following Edgar Bergen & Charlie McCarthy. His 21.1 season average was his highest rating in eleven years and the first of three consecutive seasons in the annual Top Ten. The best of times lay ahead of Allen in those three seasons. A Heartbreaker. Marlin Hurt created a character that outlived him. After a strong intro-ductory 18 months as Fibber McGee & Molly’s housekeeper, Hurt’s black, falsetto voiced Beulah was considered prime spinoff material. The first spinoff series from Wistful Vista, Hal Peary’s Great Gildersleeve, was a consistent Top 25 show on Sunday night and the same success was predicted for Hurt. FM&M assistant writer Phil Lewis was charged with writing the series scheduled for a fall debut. Unfortunately, The Marlin Hurt & Beulah Show was doomed from the start. .
Just like Kraft had placed Gildersleeve on Sunday, sponsor Tums also scheduled Beulah on Sunday - but on CBS at 8:00 p.m. ET - directly opposite Edgar Bergen & Charlie McCarthy on NBC. Sunday’s Number One program trampled Beulah’s ratings by a three to one margin. But Hurt’s happy housekeeper left the air suddenly in March for a reason far more compelling than low ratings. Marlin Hurt dropped dead of a heart attack at the age of 41. After a failed attempt to revive the show in half hour form on ABC in the spring and summer of 1947, with white actor Bob Corley in the lead, Beulah was resurrected in November when The Beulah Show returned as a CBS strip sitcom with veteran black screen actress Hattie McDaniel in the lead. (5) The series enjoyed a successful six year run and became the highest rated Multiple Run program of 1950-51. Joanie’$ Tea Room. It was a maneuver that Paley’s CBS publicity corps had to love… Lever Brothers signed comedienne Joan Davis to a “Million Dollar” contract and gave her the half hour on CBS leading into its perennial Monday leader, Lux Radio Theater. Industry sources were quick to point out that the million dollars was to cover all of her new show’s talent and production costs for two years - but why let details clutter up a good fan magazine story? Davis was touted with the publicists’ title, “Radio’s Highest Paid Female Performer,” worthy of the million dollars after scoring two Top Ten seasons co-starring with Jack Haley on the NBC sitcom Sealtest Village Store. Her new CBS show, Joanie’s Tea Room, was a similar format - the weekly misadventures of the man hungry, wise-cracking, twang-talking Davis supported by some of Hollywood’s best radio character actors. Handsome romantic baritone Andy Russell, 26, replaced Haley as her co-star - a move Davis predicted would lure the “bobby-sox.” audience. It didn’t. Davis lost a third of her Village Store audience with the new show. Joanie’s Tea Room slipped below the ratings posted in the timeslot a year earlier by Burns & Allen, who had skipped back to NBC. Nevertheless, Davis kept Tea Room in the mid-teens and Monday’s Top Ten for two seasons until Lever Brothers let her highly publicized contract expire to make way for a new and much cheaper new show hosted by a local radio personality, Arthur Godfrey‘s Talent Scouts. Name Change = No Change. Bob Hawk’s Monday night comedy quiz on CBS, Thanks To The Yanks, changed its name at mid-season to The Bob Hawk Show and changed its rules of play - awarding cash prizes to civilians instead of Camel cigarettes to servicemen. Despite the name and format changes, one thing didn’t change: Hawk’s average rating for the season, 12.4, was exactly the same as the previous season - a rarity among Top 50 programs. NBC’s Happy Returns. Twenty-four of the season’s Top 50 programs, led by four of the Top Five, were comedies - and the Top Three were back-to-back-to-back on NBC’s Tuesday night schedule, Bob Hope, Fibber McGee & Molly and Red Skelton. Skelton returned from military duty and was back on the air in December. His 18 month absence from radio cost 20% of his audience, but his 23.1 rating remained the season’s third best behind his Tuesday teammates, Hope, (27.7), and FM&M, (27.1), who also monopolized the month to month races. (See The Monthlies on this site). Fibber McGee & Molly's cast regained its peak form during the season. Gale Gordon returned from the Coast Guard and his Mayor LaTrivia character resumed his weekly verbal bouts with Fibber in October. Wistful Vista neighbors Wallace Wimple and The Old Timer were welcomed back in January with Bill Thompson’s release from the Navy. NBC’s Tuesday comedy lineup got still another lift when Lever Brothers moved the resurgent Amos & Andy from Friday into the 9:00 p.m. ET timeslot before Fibber McGee & Molly. Freeman Gosden & Charles Correll’s familiar characters gave NBC two solid hours of Tuesday dominance on their climb back to popularity. Amos & Andy would be among the annual Top Ten by the following season. From Barbours To Barber. One Man’s Family creator Carleton E. Morse launched another NBC series, His Honor The Barber. Unlike typical Morse productions, Tuesday night’s His Honor featured a movie star, veteran character actor Barry Fitzgerald. The crusty Fitzgerald, 57, had won an Oscar earlier in the year for his supporting role in 1944's Going My Way - becoming the only actor ever nominated for both Best Actor and Best Supporting Actor in the same role. His voice was unmistakable and he a natural for another Morse family-oriented series. But His Honor never got a fair trial. The program was only heard in parts of the country as NBC split the network at 7:30 to accommodate H. V. Kaltenborn’s news commentary at 7:45 in areas where Pure Oil products were sold. Unlike the Barbour family’s 27 years on the air, Fitzgerald’s barber left after 26 weeks. Wed Locked Too Long? Show business trade paper Variety had criticized Network Radio early in the season for its lack of new programs to attract listeners. Wednesday was a prime example of the resulting audience attrition forecast by the trade paper. The average rating for the night’s veteran Top Ten shows sank to its lowest level in seven years. From Wednesday’s Top Ten roster, Kay Kyser’s Kollege of Musical Knowledge had been on the list for nine consecutive seasons, Doctor Christian for seven, Eddie Cantor for six, Mr. District Attorney for five, Mr. & Mrs. North for four and Frank Sinatra for three. Outside of entertainment programming, newscasters H.V. Kaltenborn and Lowell Thomas had been among Wednesday’s Top Ten for five and 14.consecutive years, respectively. The only newcomer to Wednesday’s list was a transplant from Tuesday, Hildegarde’s Raleigh Room, pushed out of its timeslot when Red Skelton returned from the Army in December. Sponsor Brown & Williamson also had a Wednesday time period available on NBC at 8:30 which it had filled with veteran composer/conductor Sigmund Romberg’s semi-classical concerts. Romberg, 58, had a history of Network Radio shows dating back to 1934. When Raleigh Room was displaced, B&W moved the “Incomparable” Hildy’s breezy music and audience participation show into Romberg’s timeslot. Hildegarde raised the time period’s ratings by 30%, resulting in her second Top 50 season. Nevertheless, she was out at the end of the season and Wednesday was due for a shakeup the following fall. Joe’s Conn Job Is A Knockout. The all-time high Hooperating for a commercial broadcast was set on Wednesday, June 19, 1946, when Joe Louis and Billy Conn fought for the Heavyweight Championship in Yankee Stadium. It was a rematch of their fierce 1941 bout won by Louis in 13 rounds. The second fight had been delayed for five years by the fighters’ service in World War II and was eagerly awaited. It was the first championship bout ever televised - but television was still a few years away from nationwide network coverage. Most of America - registering a whopping 67.2 Hooperating and a 93.8 share of audience - was tuned to ABC’s hookup of 224 stations for Don Dunphy’s piercing machine gun call of the fight and commentary by Bill Corum, the gravel voiced boxing reporter for Hearst’s New York Journal-American as Louis knocked out Conn in the eighth round. Thursday’s Distant Thunder. NBC continued to dominate Thursday night ratings despite disruptions in its leading shows sponsored by food companies. General Foods’ Maxwell House Coffee dumped Frank Morgan and brought in Burns & Allen from CBS for its half hour at 8:00. Ratings dropped a fraction in George and Gracie’s fifth jump between the two networks. Sealtest covered its Village Store’s loss of Joan Davis and paired Jack Haley with a new co-star, movie actress/comedienne Eve Arden. As a result, Village Store suffered a 25% loss in audience. But NBC’s greatest concern was Bing Crosby’ walkout from Kraft Music Hall at 9:00. Crosby, 1945's Oscar winning actor for Going My Way, quit Music Hall in a dispute over his demand to pre-record his shows. Neither the sponsor nor NBC would allow it, so the star simply didn’t report for work in October. Kraft sued Crosby for breach of contract and turned to the deposed Frank Morgan who was without a Thursday night radio job for the first time seven years. While the Crosby-Kraft battle dragged on in the courts, Morgan kept Music Hall open through January with guest stars and Eddie Duchin’s orchestra. The show’s ratings drifted down from the 20's into the mid-teens. Pabst Taps For Kaye. Pabst Beer kept comedian Danny Kaye on the CBS Friday schedule for a second year and moved his show back to 10:00 in the 1945-46 season to capitalize on the comedy lead-in provided by Jimmy Durante & Garry Moore. The shift was rewarded with an improvement in Kaye’s ratings beyond the single digits of the previous season. But The Danny Kaye Show was a costly production that included high-priced writing talents of Goodman Ace and Abe Burrows. Then Kaye’s personal appearance commitments forced the show to move from Hollywood to New York in March which called for an entirely new supporting cast led by Kenny Delmar to replace Eve Arden and Lionel Stander whose careers were based in Hollywood. The two versions of The Danny Kaye Show combined to finish in Friday’s Top Ten but still failed to reach the season’s Top 50 and Pabst cancelled the program in June. Although he continued to become a major film and television star who won Golden Globe and Emmy awards plus honorary Oscars, Danny Kaye never returned to series radio. Hush Money. Ralph Edwards was up to his serial stunt tricks again with a twist that propelled Truth Or Consequences into the annual Top 20 for the first of three consecutive seasons - a feat that no other Saturday night program would ever match. A famous but unidentified celebrity was introduced by Edwards on his December 29th show as “Mister Hush”. The first TOrC contestant to correctly identify him would win a jackpot of prizes. The secret celebrity read the pre-recorded clues to his identity every week while more prizes were piled into the jackpot with every incorrect guess. The concept wasn’t new. Arlene Francis’ What’s My Name? had been based on a similar idea since 1938 - only with far fewer and smaller prizes than the bonanza that Truth Or Consequences offered. What made Edwards’ take on the concept so special was the magnitude of the prizes he gleefully dangled before his growing audience every week, all hungry for the merchandise that was denied them during World War II. He promised a new, 1946 Mercury automobile, a fur coat, a diamond ring, a piano, a Bendix washer, Crosley refrigerator, Tappan kitchen range, RCA Victor console radio-phonograph - and two years’ supply of nylon stockings. Edwards obtained all the merchandise in exchange for healthy plugs on Truth Or Consequences. After five weeks, the jackpot reached $13,000 worth of prizes and “Mister Hush” was correctly identified as legendary boxing champion Jack Dempsey. Riley Gets New Life. Actor William Bendix was 39 with 17 films to his credit including one that won an Oscar nomination for his supporting role in 1942's Wake Island. He originated the role most associated with him, Chester A. Riley, the lovable blue-collar head of the family on Blue's The Life of Riley in January, 1945. The sitcom had a shaky start. It hobbled along in the Sunday ratings for six months opposite the CBS comedy quiz, Take It Or Leave It. Procter & Gamble rescued the show in September by moving it to Saturday at 8:00 p.m. ET on NBC, immediately prior to its hit, Truth Or Consequences. The Bendix sitcom doubled its previous ratings and vaulted into 28th place for the season. It was the first of six consecutive Top 50 seasons for Riley, his family and neighbors - most notably character actor John Brown’s Digby (Digger) O’Dell, “The Friendly Undertaker”. During those six years Bendix also appeared in another 25 movies, including the 1949 Universal exploitation film based on the series, The Life of Riley. Good News Is Bad For News. The good news was that the war was over. Yet, the world was still in turmoil and a record 29 separate prime time news programs appeared in the season’s rating books. The bad news was that newscast ratings were rapidly sinking. Only one Multiple Run newscast, Lowell Thomas’ 6:45 strip on NBC, made the season’s Top 50 - but the veteran newsman fell from 27th to 40th in the rankings with his lowest rating in eight years. H. V. Kaltenborn lost 30% of his audience and dropped out of the season’s Top 50 for the first time in five years. He would never return. Most dramatic of the drops was Gabriel Heatter’s fall from 48th to 117th in the rankings, the result of losing over 45% of his 9:00 nightly audience on Mutual - an estimated four million listeners. Veteran newscaster Elmer Davis returned to radio after his successful service as Director of the Office of War Information. Wary of the new “objective” climate at CBS News that prompted his colleague Cecil Brown to leave the network in 1944, Davis signed with ABC for $1,500 per broadcast, and a clause in his contract that allowed him to editorialize if he so desired. 15 Minutes of Fame For Five Years. As it had with the first rush of Bing Crosby’s popularity in 1932, and the Glenn Miller band in 1939, Liggett & Myers proved that it still had an ear for musical talent and trends. It smartly identified its Chesterfield brand with the three top vocalists of the immediate postwar years. Perry Como, 33, headlined NBC’s Chesterfield Supper Club on Monday Wednesday and Friday nights at 7:00 ET.. Jo Stafford, 28, hosted the quarter hour of pop music on Tuesday and Thursday. Stafford had left Tommy Dorsey’s band in 1942 and spent two years performing countless USO camp shows where she earned the nickname, “GI Jo.” She later became Columbia Records’ best selling female vocalist. When she departed Supper Club’s Thursday shows in 1948, Capitol Records’ top female singer, Peggy Lee, took over. The three enjoyed five seasons in the Multiple Runs’ Top Ten. Big Spender Splits CBS. The year’s biggest broadcast advertising spender, Procter & Gamble, split the CBS network on weeknights at 7:00 for two quarter hour strips sponsored by Ivory Soap. Half the network was fed The Jack Kirkwood Show, a 15 minute variety series starring the comedian, his wife Lillian Leigh and a supporting cast that included radio veterans Herb Sheldon and Ransom Sherman. For regions where Kirkwood’s off-the-wall humor wasn’t considered a good fit, CBS stations carried Mommie & The Men, a soap opera featuring busy radio actors Elspeth Eric, Lon Clark and Jackie Grimes. Both programs were cancelled in March, replaced on the full CBS network by The Mystery of The Week - a detective stories told in five nightly chapters, starring Harold Huber as Agatha Christie’s sleuth, Hercule Poirot. But none of these efforts could beat the Perry Como/Jo Stafford pop music combination on NBC. (1) War Time - the designation given to year round Daylight Savings during the duration - was declared officially over on September 30, 1945. Some localities reverted to Standard Time while others waited until later in the year. Standardization of the beginning and end dates of Daylight Savings in the United States didn’t take effect until 1966. But even then, enough loopholes were in the bill to allow local options which could confuse the broadcast schedules from one municipality to another. (2) Benny's spring ratings were further helped on St. Patrick's Day, 1946, (March 17), when tenor/foil Dennis Day returned to the cast from his World War II service in the Navy. (3) Fred Allen’s year of “rest” for his health included writing and starring in the movie comedy, It’s In The Bag! (5) Hattie McDaniel played Beulah until she fell ill in 1951. The role was then alternated between sisters Lillian and Amanda Randolph until Beulah left the air in April, 1953. (6) Perry Como’s Til the End of Time - with melody provided by Chopin’s Polonaise - was 1945's Number One record. His three-times a week Supper Club led to an NBC-TV version of the program in 1949, and a succession of highly popular weekly television variety hours.